There were funky uniforms on both sides, and a slew of great plays in the outfield. 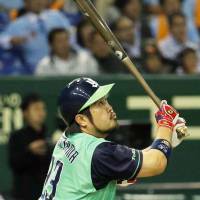 In the end, it was Kazuhiro Hatakeyama and the Tokyo Yakult Swallows who put their stamp on the first round of a colorful battle for Tokyo supremacy. Hatakeyama hit a tiebreaking solo home run in the top of the 11th, closer Tony Barnette shut the door on the Yomiuri Giants in the bottom half, and the Swallows earned a 3-2 victory over their crosstown rivals in the first game of the so-called “Tokyo Series” after 4 hours and 2 minutes in front of a crowd of 46,135 on Friday night at Tokyo Dome. “I just wanted to do something because our pitchers have been carrying us and it was a long night,” Hatakeyama said. Hatakeyama watched two pitches from Hirokazu Sawamura sail by out of the zone before muscling a 148-kph fastball into the seats in right field to give Yakult a one-run advantage in the 11th. Barnette did the rest, allowing a hit but no runs to convert his fourth save of the season. Ryo Akiyoshi (2-0) earned the win with two-thirds of an inning of scoreless relief. Sawamura (1-1) took the loss. While the Giants and Swallows regularly face each other, Yomiuri won last year’s season series 13-11, and their first two series of 2015 have been dubbed the Tokyo Series. Both teams unveiled uniforms bearing the metropolis’ name over the offseason and will wear them for the six Tokyo vs. Tokyo matchups. The series continues over the next two nights at the Giants’ home park, with three more games scheduled for April 24-26 at the Swallows’ Jingu Stadium. Neither team looked very familiar on Friday. The Giants were the home team but wore their new road uniforms, which consist of light blue tops and pants with “Tokyo” emblazoned, in black lettering, with an orange outline, across the chest. The Swallows’ uniforms also had “Tokyo” on the front, in blue, and their jerseys were green with blue sleeves. The Birds wore high navy blue socks with their white pants. The Swallows, who have finished last in the Central League the past two years and had the worst ERA in the league in 2014, have ridden their pitching to a fast start. Yakult’s pitchers have yet to allow more than three runs in a game this year. The team is 8-5 and tied with the Yokohama BayStars and Chunichi Dragons for the best record in the CL at this early juncture. Yakult’s last three contests have been one-run victories. 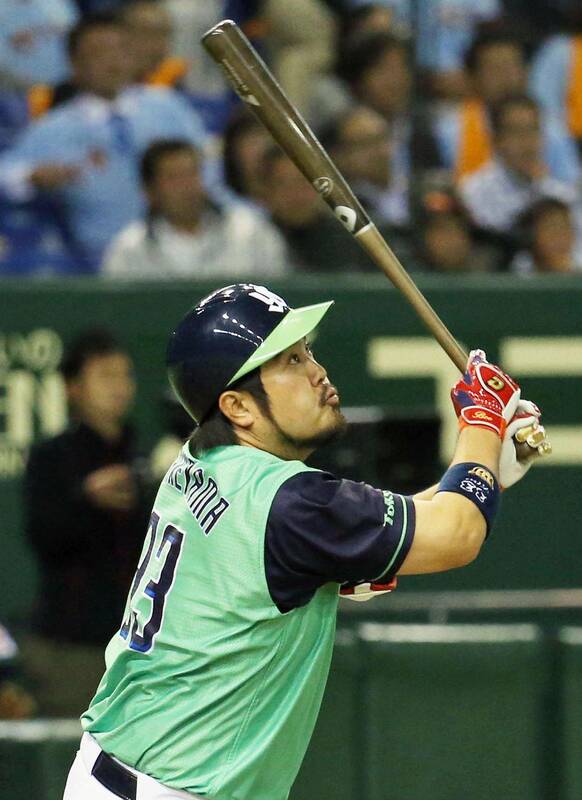 Yakult’s Shingo Kawabata collected four hits and drove in a run. Takahiro Araki also had a multi-hit night, finishing 2-for-3, and Yuhei Takai was 1-for-5 with an RBI single. Tatsuhiko Kinjo finished 1-for-5 and drove in his first two runs since joining the Giants as a free agent over the offseason. Yoshiyuki Kamei had a pair of hits and also made a nice catch in right field for Yomiuri. Center fielder Tetsuya Matsumoto helped keep the Yomiuri deficit at one run with a fantastic leaping catch against the wall in the 11th. He was slow to get up and was greeted by the Yomiuri trainers, but was no worse for wear as he made a running catch in center on the very next play. Frederich Cepeda also flashed some glove in left, making a grab on the run, and firing the ball back to the relay man, Hayato Sakamoto, who doubled up a runner at first in the fourth. The Swallows got on the board early, with Takai driving in Kawabata with a single in the top of the first. Kamei led off the Giants’ half of the second with a single. The next batter, Hirokazu Ibata, was hit by a pitch, and Cepeda walked to load the bases with no outs. Ogawa then retired Shuichi Murata and Aaron Poreda, but Kinjo singled in two runs to put Yomiuri ahead. The Giants nursed a one-run advantage until the top of the seventh, when Kawabata stepped to the plate with runners on the corners and two outs and delivered a game-tying single. The score remained tied until Hatakeyama’s big hit in the 11th. “It’s always good when we beat the Giants, especially at Tokyo Dome,” he said. Nagoya — Chunichi’s Opening Day starter Daisuke Yamai (1-0) allowed two runs in eight innings to pick up his first victory of the season in the Dragons’ 6-2 win over the Yokohama BayStars on Friday night in the Central League. The Dragons took the lead in the eighth on Anderson Hernandez’s RBI single. Carp at Tigers — ppd. At Sendai’s Kobo Stadium, after waiting two years for his first victory in Japan, Tohoku Rakuten’s Kenny Ray allowed two runs in six-plus innings to beat last-place Orix and earn his second in two starts.